Charon Inc is designed by Emanuele Ornella who designed Assyria and Il Principe among others (and who I interviewed last year). 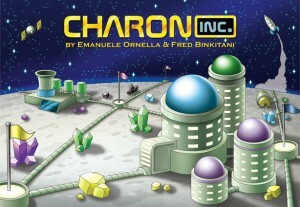 In Charon Inc players place flags to take control of different areas of a moon in order to get gems which are used to build buildings to score victory points (VPs) – most VPs at the end of the game wins. It may sound like pretty standard stuff but there are some clever game mechanics that create lots of interaction and tactical decision-making.